A national umpire seminar was organised at NJK, in Helsinki in 18-19 February. There were nine participants, who were new to umpiring and five, who already had the NU / IU status. 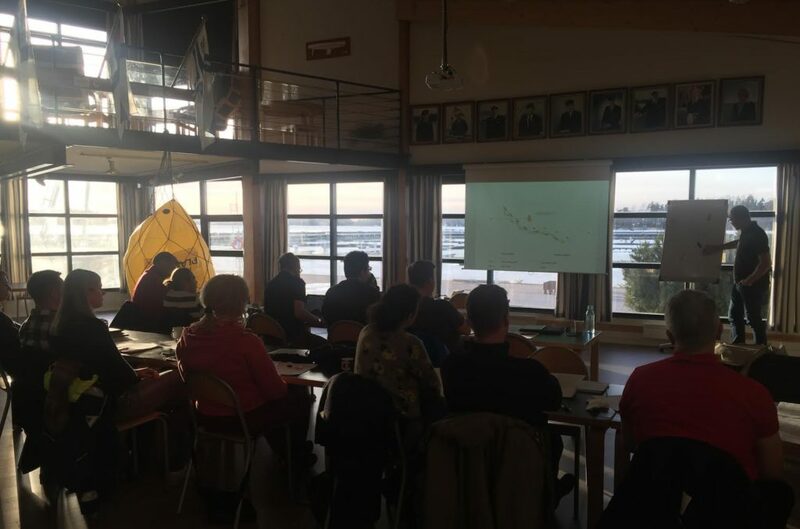 The seminar was, like many times before, ran by Mats Björklund, an international umpire and national judge, with extensive experience from, among other things, America’s Cup and the Olympics. The seminar was timely especially because the Racing Rules of Sailing were updated at the beginning of the year. Even though there are not many changes on top of adopting the test rules from last couple of years into the rule book, it is always good to refresh one’s mind at the beginning of the new season. The seminar and the written test which concludes it are not a walk in the park, unless you come prepared. Out of the 11 who took the written exam at the end of the course, four passed. Two of the four were already with Umpire status, so they took the test just to show that they still remember things. The other two, Mika Lindholm and Janne Timonen, passed the test for the first time. Congratulations! In order to be eligible to apply for the National Umpire status, they still have to pass an on-the-water assessment at one of the G4 events or higher and be part of the umpire team in at least four events. After this their yacht club can recommend to the National Authority, SPV, that they be granted the NU status. Please find attached the Notice of Race for three of the most important and popular sailing championships in Europe during 2016. The EUROSAF Youth Sailing, European Championship is taking place in Neusiedl am See, Austria, between 15th and 21st August. The EUROSAF Match Racing, Youth Open European Championship will be in Ledro, Italy between 7th and 10th July. For the first time in 2016, the Youth Sailing, European Championship, which is for sailors under the age of 18 on 31st December this year, has opened its entry to non-European sailors, thus widening the scope of the championship and increasing the level of competition within the event. Entries are open to all Member National Authorities and completion takes place in the World Sailing Youth Classes. The Open European Match Racing Championship is being held as part of the 150th anniversary celebrations of the Royal Danish Yacht Club, who are organising the championship at their base in Svendborg and the Youth Match Racing, Open European Championship, is returning to a favourite host venue of Lake Ledro, hosted by Association Vela Lago Di Ledro. Applications for invitations to enter both match racing events are now open. Information on entering each of these European Championships are contained in the attached Notices of Race. Please give your support to all EUROSAF organised sailing championships.